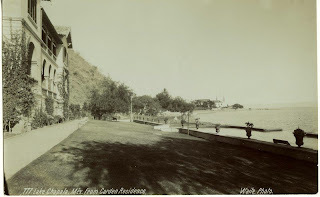 Lionel (later Sir Lionel) Carden of the Barnane branch built Villa Tlalocan at Lake Chapala in about 1895 while he was the British Consul in Mexico City. It is described as 'majestic' by local sources. It appears in the postcard reproduced here, dated about 1904. Click on the picture to enlarge it and read the caption, which mentions Carden. Lionel was Minister at Havana 1902-05 and returned to Mexico again as Minister in Mexico in 1913-14 (knighted by then) during a period of great turmoil. He played a decisive and controversial role in dealings with the dictator Huerta described at length in The Secret War in Mexico by Friedrich Katz (Chicago 1981), and inadequately in the new Oxford DNB and in my book Carden of Barnane. The picture and information have kindly been supplied by Tony Burton of http://www.mexconnect.com/ who is writing a book about those who lived at Lake Chapala at that period. Tony now adds: My guess would be that he sold it at roughly the time he left for Cuba, but certainly the property had been sold twice by about 1908, and it is very unlikely that Carden (having been close to Diaz) would have risked visiting Chapala in 1913-1914, though I'll keep my eyes open for any evidence either way. The recent book Fenian Fire by Christy Campbell relates the extraordinary involvement of Lionel Carden, while Consul in Mexico, in running the Irish terrorist General Millen as a spy while he was responsible for many dynamite outrages in England which culminated in a bomb in the House of Commons in 1887, the year of Queen Victoria’s jubilee. I can add another small detail to the story.